SYDNEY, Feb 28 2013 (IPS) - Women face greater odds in achieving equal political representation in the Pacific Islands than in any other region of the world, holding just 3 percent of seats in national parliaments, compared to 20 percent in Sub-Saharan Africa and 18.5 percent in South East Asia. 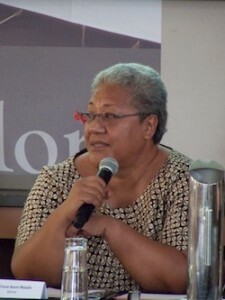 Following the first Pacific Women’s Parliamentary Partnerships Forum hosted by the Australian government in Sydney this month, Fiame Naomi Mata’afa, the longest serving female parliamentarian in the Pacific region, spoke to IPS about the challenges of gaining political office and some of the measures being pursued to redress the stark imbalance. Fiame was first elected in 1985 to the parliament of Samoa, a Polynesian nation located north-east of Fiji and first in the region to achieve Independence in 1962. She is a ‘matai’ or high chief, as was her father, Fiame Mata’afa Faumuina Mulinu’u II, the first prime minister of Samoa. In addition to representing the Lotofaga electorate in Atua district on the most populous island Upolu, she has served as minister of education, minister for women, community and social development and presently holds the portfolio for justice and courts administration. She was one of 40 female MPs from the Pacific Islands and Australia, including Cook Islands opposition MP Selina Napa, and Delilah Gore and Julie Soso Akeke from Papua New Guinea, who attended the first regional consultation of the Pacific Women’s Parliamentary Partnerships Programme. Part of the Australian ‘Pacific Women Shaping Pacific Development’ initiative supported by AusAID, its objective is to increase the professional skills and capacity of women politicians in the region. “It is a good start in terms of saying, yes, people are serious about this,” Fiame told IPS. “We got some clarity around the kind of approaches that could be taken. There is a website that could assist with developing the women’s network to become an information exchange, enabling direct contact between members and research assistance on parliamentary issues and political approaches. The Millennium Development Goal 3 (MDG 3) on promoting the rights of women, and the Pacific Platform for Action on Advancement of Women and Gender Equality both promote the goal of governments attaining a proportion of 30 percent women in decision-making roles. Samoa, which has two women in parliament, rates at 4.1 percent, the Marshall Islands 3 percent, Papua New Guinea 2.7 percent and Vanuatu nil. There have, however, been some recent incremental gains. In national elections held last year, three women entered parliament in Palau, one was elected in the Solomon Islands and three in Papua New Guinea. Many reasons have been suggested for the persistent disparity, such as traditional patriarchal cultures, historical influence of male dominated colonial administrations, corruption and lack of political party reform, and lack of financial resources and campaigning skills. The reality of the unequal playing field has long been recognised by the region’s leaders, so why the lack of substantial progress? In the 2011 Samoan election nine of 158 candidates were women. At Independence, the Samoan people chose via a referendum to retain ‘Fa’a matai’, the indigenous system of governance based on elected chiefs, or ‘matais’, who bear responsibility for the affairs and customary lands of extended families. “We don’t have automatic succession,” Fiame pointed out. “When a titleholder passes away, the extended family come together to decide who will succeed. It is very democratic, but it is also a very political process.” Nevertheless, the Lands and Titles Court will arbitrate a decision in the absence of consensus. The Legislative Assembly has 49 seats, of which 47 are reserved for male and female ‘matais’ and two for representatives of Samoa’s diverse communities. Although 48 percent of the population is female, the 2011 census revealed 89 percent of ‘matais’ were male and 11 percent female. In contrast, there is now gender equality at all levels of education in Samoa with females consistently outperforming male students. Education to change cultural and social attitudes and produce greater voter support for women MPs are long term goals across the region. But temporary special measures, such as quotas and reserved seats, could potentially make a difference, even though women themselves have mixed opinions. Last year, a constitutional amendment bill was tabled in the Samoan parliament to grant a 10 percent quota of women members, equating to five reserved seats. “It (the Bill) is in its second reading and hopefully it will come through at our next sitting,” she clarified, admitting that one of the “crunch” issues could be the political interests of her male colleagues in view of possible competition from women in their electorates. But she firmly believes that the beginning of a serious dialogue about women in governance throughout the nation is imperative to challenging mindsets. What is the One People’s Public Trust? the massive fraud and theft taking place at the time. inflicted, they decided that that the only solution was to terminate the entire system through UCC filings.The final report from the investigation is to be found here.